Not all Ethernet cable is created equally. What’s the difference, and how do you know which one you should use? 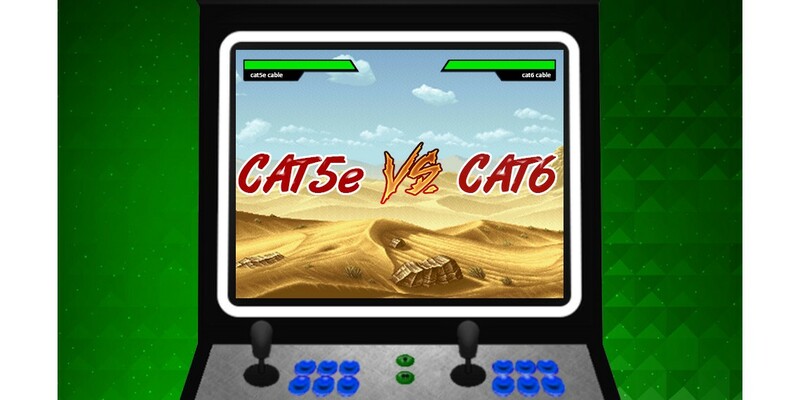 We take a quick look at the differences in CAT5e and CAT6 Ethernet cable to help you decide. CAT 5e (Category 5 enhanced) is currently the most commonly used network cable. It’s cheaper than CAT6 cable, and still provides great performance. It’s designed to greatly reduce crosstalk in comparison to the older legacy CAT5 cable standard. Crosstalk is basically when the signal ‘channels’ on the cable interfere with each other, or is influenced by outside interference (such as electromagnetic interference when running a network cable right next to a high voltage power able). CAT5e is better at keeping signals on different ‘circuits’ or ‘channels’ from interfering with each other. Having superseded CAT5, CAT5e can handle 1000Mbps speeds (Gigabit Ethernet) at 100 MHz bandwidth, and is still backwards compatible for those running 10 or 100Mbps networks. Category 6 is the next step up from CAT5e and provides a lot of additional benefits. Having a higher bandwidth capacity (250MHz as oppose to 100MHz with CAT5 & CAT5e) allows CAT6 cable to achieve faster speeds and can handle more concurrent data load. It's suitable for up to 10Gbps Ethernet at 250 MHz bandwidth. You might be wondering what exactly the 100MHz and 250MHz references are? Simply put, it’s the frequency capacity of the cable. For an easy to understand reference, think of 100MHz bandwidth being a single lane highway, while 250MHz is a 3 lane highway; more cars can travel on the 3 lane highway simultaneously (with the cars essentially being data packets). Getting back to the issue of Crosstalk, CAT6 also has major improvements here due to having a “crosstalk divider” insert in the middle of the wire pairs to keep the pairs isolated from each other, meaning less interference. 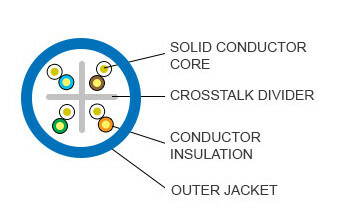 Generally, CAT6 network cable has a slightly thicker conductor diameter of 23AWG (in comparison with the slightly narrower 24AWG of CAT5e). It’s also backwards compatible with CAT5e cable and can be used in 10/100/1000Mbps applications. In short, CAT5e can provide 1Gbps speed with 100MHz frequency bandwidth, while CAT6 can provide 1Gbps up to 10Gbps speed with 250MHz frequency bandwidth and has better crosstalk protection. Bear in mind, both CAT5e and CAT6 network cable still has a max 100meter distance limit, and we always recommend keeping cable lengths under 80meters to unsure reliability and performance. Ultimately, those who want to have the most “future proofed” cable infrastructure, or require a high speed cable network, will want to go with CAT6 cabling.